This is your personal invitation to share Carnival Paradise Cruise Reviews with the world. I encourage you to listen to the video cruise reviews below and then share your own written review of Carnival Paradise. If, like me, you have sailed from Tampa with Carnival Paradise, then you should have a great story to share. Unless, of course, things just went awfully wrong. It is sad that one unfortunate occurrence on a cruise ship can dampen the rest of the cruise for some passengers. Luckily for us, my family's sixth cruise with Carnival Cruise Line happened to be on Carnival Paradise, July 2012 and just about everything went well. The Paradise sails out of Tampa. While the Tampa Port is home to several cruise ship sailings - Holland America, Norwegian, Carnival, etc., the area allotted to Carnival check-ins is not the best. Compared to Miami, the Carnival check-in area in Tampa is relatively small. Cruise passengers stretched outside in the line. The line moved at a relatively fair pace, but it still appeared that the trip from outside to the check-in counter took longer than elsewhere. Anyway, that is all minor. After you get past the check-in counter, it is time for the pre-boarding photo with the family and then onto the ship. The ship is beautifully designed. Upon boarding Carnival Paradise, you will enter the Empress Deck (Deck 7), the ground level of the atrium. Look up and be amazed by the atrium! Such a spectacular sight! The main boarding area contains Guest Services, the Shore Excursion Desk, a bar with a pianist and comfortable seating on both sides. I was ready to just hang out and relax right there. However, there was much more to see! I have come to expect the best in dining options on cruise ships and was not disappointed. In addition to the two main dining rooms - Elation Dining and Destiny Dining Rooms - Carnival Paradise offers (like all other ships) buffet dining. This was on the lido deck in the Paris Restaurant. The cuisine choices in the Paris Restaurant were most welcoming. There was the All American cuisine, Italian cuisine, French cuisine, Caribbean cuisine, a deli option and Asian cuisine (not all at once). In addition, there was a grill option always going on and a rotisserie section. I believe there was something for just about everyone! For those who chose a waiter-appointed four course dining (we did for dinner each evening), the menu offered some classic options plus new items every evening! 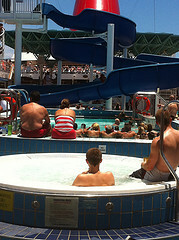 I believe that being pampered is one reason so many people love to cruise. We were quite pleased with our cabin stewards' efforts to remember all our names - even when I had trouble pronouncing theirs. 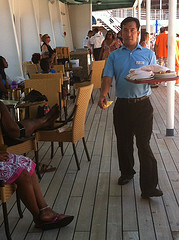 You will find that most cruise ship crew members are from many countries around the world. Our cabin stewards were from Indonesia. We chose "Your Time Dining" for dinner (anytime between 5:45 and 9:30) and was impressed with one main waiter who remembered my name for the duration of the cruise, even though we were only served by his team one evening. I could not end talking about Carnival Paradise crew without mentioning the guys and gals who work in the buffet restaurant. They were quick to clean up after us (yes, I know they were doing their jobs) and ensured there were enough available tables for the vast number of cruise passengers converging on the dining room at meal times. Kudos to all the crew members! 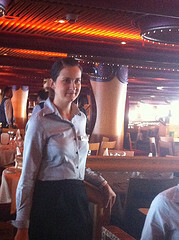 Our Cruise Director on Carnival Paradise was "Sparkles", who really sparkled. She was ably assisted by "Island Girl", "Sassy Cassy" and others. You know that staff members onboard any cruise ship push certain things to get you to spend - such as bingo, gift shop sales and art auctions - however, they also did an excellent job getting people involved, and keeping them entertained. So, whether it was the hairiest chest game, the marriage game or the best cocktail game, there were various activities designed to get as many cruise passengers as possible engaged and having fun. The Paradise currently offers 4-day cruises from Tampa to Cozumel or Havana, Cuba; 5-day cruises from Tampa to Key West and Cozumel or Key West and Havana; and limited longer cruises that include Grand Cayman. 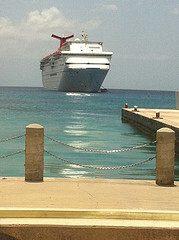 In 2012, the 5-day option was to Grand Cayman and Cozumel. 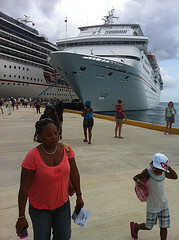 This itinerary was once offered by Carnival Sensation (our first cruise ship experience). 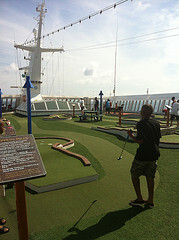 We enjoyed both ports of call on our first cruise in 2004 and it was good to be back in 2012. 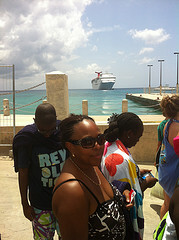 In Grand Cayman, we toured the island and then visited Rum Point Beach. In Cozumel, we toured half of the island and then visited the Ocean Beach. Grand Cayman is always a treat! The water is clear and beautiful and there are many fun activities to do. The same is true for Cozumel. However, on this trip we stopped at a beach that was not pleasant. It was a rough sea day and may have accounted for the mixing of water and dirt, because the beach water was "dirty." Luckily, this beach club had a pool and hot tub, so we spent our time there. The beach was quite disappointing, because Cozumel is known for great beaches. One of the most disappointing things about our cruise was the "past guest" appreciation experience. Generally, there is a reception held in the main lounge (theater) and free drinks and snack items are served. On this cruise, past guests were offered a voucher for a free drink. That was fine. However, there were restrictions. The drink could only be had for breakfast or lunch and had to be ordered in one of the dining rooms. We tried to get someone to fill our order elsewhere, but that was unsuccessful. Unfortunately, we did not have lunch in the dining rooms and so did not get our "past guest" free drinks. 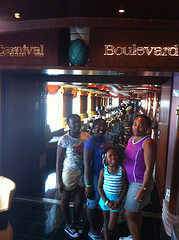 Putting that sour happening aside, our Carnival Paradise cruise experience was fantastic! Below, fellow guests speak of their Paradise cruise experience. Have You Sailed With Carnival Paradise? If you have sailed with Carnival Paradise, we would love to hear about it! 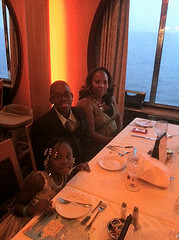 My family recently sailed on the Paradise and had an overall great experience. How about you? What was the best experience for you? Please write your own review of your family's Carnival Paradise cruise.